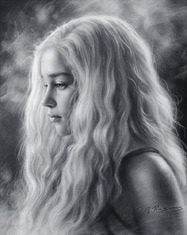 Do you want to learn how to make money as a portrait artist? Then read this page, all that is described here is all from my personal experience. 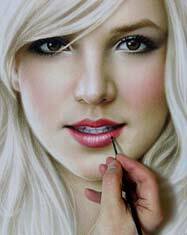 Are you an artist of any age who is good at drawing facial proportions with pencil, charcoal, sanguine, or pastels, trying to make money as a street artist, but with little success? 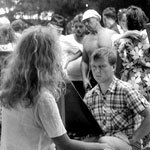 For days you sit in the street among other artists and you have very little work, poor earnings, despite the fact that you have an attractive portfolio of portraits drawn in pencil, charcoal and pastels? People don't pay enough attention to these samples, and all the while you need to earn money to feed your family, and you do not know how to make enough. You can not make money on Forex Club, you do not have expensive stocks on the Petroleum Exchange, and you do not have any other profitable businesses which allow you to earn a lot of money. Your chosen business is portraiture and nothing else. It's certainly not a rich business, you do not earn millions of dollars, unless you become a famous artist. But if there is no other choice, then you can learn how to make money as an artist and keep your family in reasonable prosperity. It is possible, the most important thing is your desire to do it, to have a little bit of patience and all will be well. Twenty-five years ago, when I was still a very young portrait artist, I also decided, as you, to draw portraits on the street to earn money. 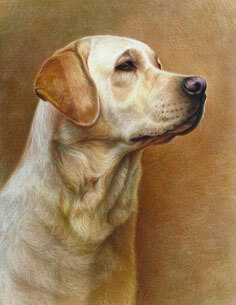 I then drew with a pencil and some with pastels and I loved it, but I didn't yet know how to make money as an artist. 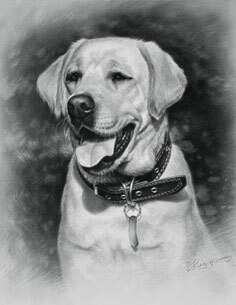 I drew for about a year in pencil and pastel, and my earnings didn't please me, since some of my colleagues were earning a lot by drawing portraits using dry brush technique. 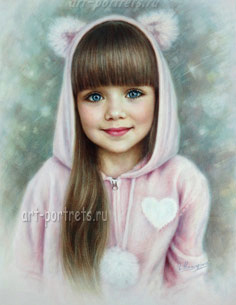 But I didn't take time out, and continued to draw in pencil and with pastels, that is, I did not want to change my drawing technique, because I had got used to it and I was young and stubborn, and really did not understand. But I often thought and reflected on how to make money. But it could not last long, comparing my earnings to the earnings of my colleagues in this business, and I still decided to try to draw portraits using dry brush technique. And what do you know? In 2 weeks I got used this technique of drawing and I started to like it more and more, I began to earn a lot more money by drawing portraits using dry brush, my income had increased by 5-7 times, and then even more. I began to have a better understanding as to how artists make money. My portraits in dry brush technique became very popular among women and around me formed a queue of women wishing to have a portrait drawn by Igor Kazarin. 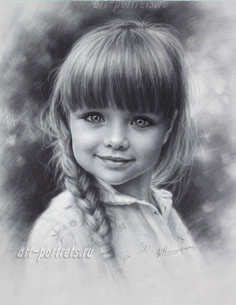 It was the enormous change in my life, all passers-by began to pay attention to my samples of portraits drawn in dry brush technique , I had almost no rest, all the while I was at work. In 2-3 years I have perfected my new dry brush portrait drawing technique. 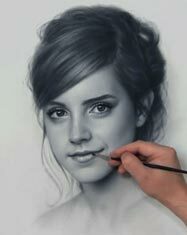 After seeing me, many of my colleagues who still drew portraits in pencil, charcoal and pastel gradually changed their drawing techniques and their world view. They gradually came to understand and began to draw only with a dry brush. 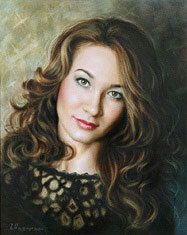 In Moscow on Arbat Street in the mid 90 's I drew a lot of foreigners, among them were many American students. For them it was also a novelty, they were not interested in the techniques using charcoal, pastel or pencil and they always preferred to have a dry brush portrait, because many of them were attracted by my samples of portraits using dry brush and they liked to watch how I created portraits with this technique. 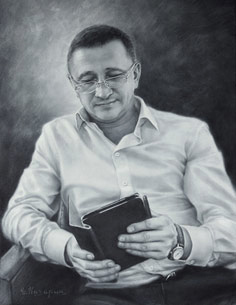 Many years have passed and today, for example, on Arbat Street, 99% of portrait artists draw portraits in dry brush technique, you have probably already guessed, why? They learnt how an artist can make money. Someone may ask, what is the magic of this painting technique? They simply haven't accepted this secret phenomenon. 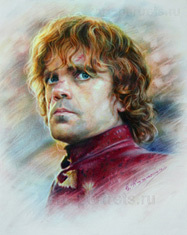 For many years I wondered how people chose an artist to draw their portrait. I noticed that 99% always chose a portrait artist using dry brush. Why is this technique so attractive, for example to women? We all know that artists draw women more than anyone else, as we all know how a woman wants to see herself on a portrait. 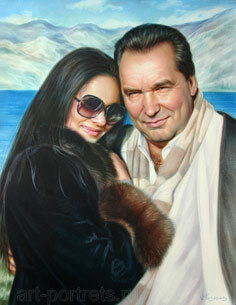 I am often asked questions from portrait artists from around the world. There have been a lot of interested artists from America, Canada and Europe, as well as artists from the Middle East. How can one learn this technique? What materials do I use to draw? Until now, many people have thought that I use charcoal powder:) I was certainly surprised that for many foreign artists it is a new method. I understand that the West is very democratic, but despite this a lot of information has not been disclosed. As I understand, many journalists of art are not allowed to write articles on the the free themes, despite the fact that people may like it. 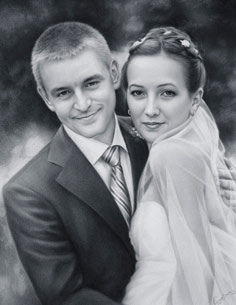 We in Russia and the CIS have shared this technique for a long time, and it is considered the most popular, most advanced and therefore the most profitable technique of drawing portraits from life and photographs, so if you decide to earn money by drawing portraits, then other methods of drawing cannot compete with dry brush.